Back on my 2005 trip to London, I picked up the most beautiful, colourful, and typical umbrella depicting the London underground map. And it cost me between £10-£20 (I know, it’s a big range). It’s the perfect, flashy, and practical souvenir when you live in the soggy, water-logged city I currently reside in. Since the Tube umbrella finally died and it was quite embarrassing to walk around with a crippled umbrella, I wanted to pick up another subway map umbrella–Beijing? Hong Kong? 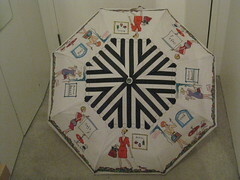 I could browse for MTR products online and could see they did not sell an umbrella. Was I out of luck for a souvenir umbrella? We were walking around Tsim Tsa Tsui on Day 3 (a rainy one) in Hong Kong and I saw a mother giving her young daughter a new umbrella. 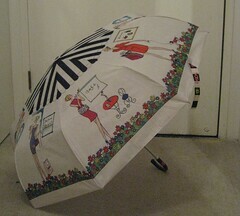 And then I saw the umbrella sold at the 莎莎 Sasa (cosmetics) shop for HKD$49. That was a far better price than the Tube umbrella and there was also a curved handle, on my features wishlist for my next umbrella. What I sadly did not know was how to read the promotion, other than the price. I brought the umbrella to the counter and tried to pay $49 but was told that I need to purchase an item in additional. It was just one example of several of how I can’t really get around, even being conversationally fluent and somewhat literate. Sigh.